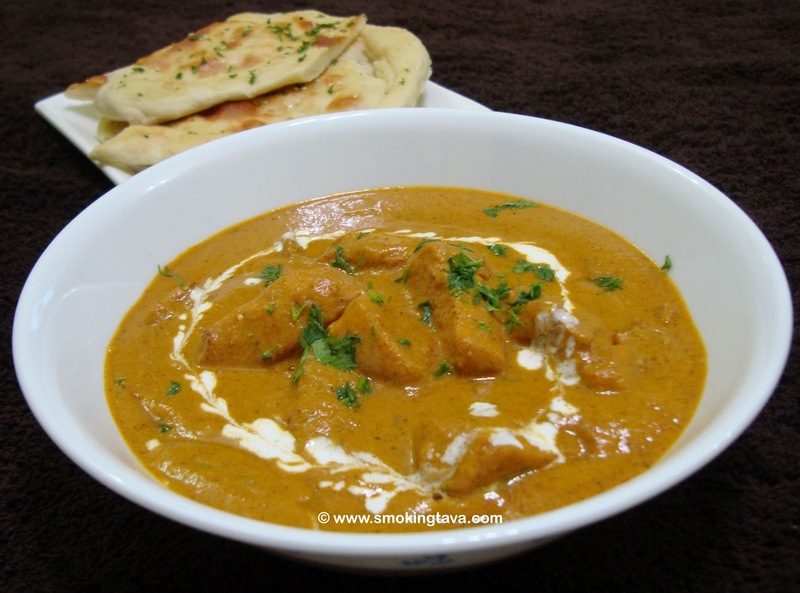 World renowned Indian curry, next to ofcourse the infamous Chicken Tikka Masala, Butter Chicken is enjoyed with plain or buttered Naan. Succulent chicken breast strips cooked in rich, creamy buttery tomato and onion sauce is an absolute winner on taste, my family just loved it. Hope you like the recipe..Enjoy!! Take chicken in a bowl, add 1 tsp red chilly powder, 1 tsp corriander powder, 2 tsp ginger garlic paste and salt. Mix thoroughly with your hands, massaging the spices into the chicken pieces. Heat oil in a pan (shallow fry pan), when its smoking hot, add chicken saute for around 2 mintues. Just sear the chicken to ensure all the moisture is trapped within. Drain and keep the chicken aside (we'll the need the juices that will ooze out of the fried chicken). In the same pan, fry onion, add 2 tsp of ginger garlic paste, 1 tsp corriander powder, 1 ½ tsp red chilly powder. Add 1 ½ cup of water, cashew nuts, bring to a boil. To this, add tomato, kasuri methi (crushed to powder using your palm). Cover and cook till tomatoes are soft and mushy. Switch of heat and let it cool slightly before blending into a smooth sauce in a food processor/mixer (make sure to cool it sufficiently well, else it may explode out of your food processor because of all the steam generated). Heat the pan again, on a high flame, melt the butter, add all juices that would have oozed out of the fried chicken. Add the blended sauce, 1 ½ cup water, salt, bring to a boil. I have avoided using food colours here. But, you can add red colour at this point to make it restaurant like. Add sugar, chicken. Simmer, cover and cook for around 5 mintues or till the chicken is done. Now add cream, garam masala, switch off after a minute or two. Garnish with corriander leaves. Enjoy with Naan or steamed rice.